The Cultural Maturity link at the top of any page provides a short overview description of the concept of Cultural Maturity. You should read it first and then return to this more extended overview if you are not familiar with the basic concept. Much of Cultural Maturity’s power as a concept comes from its simplicity once it is sufficiently understood. But understanding requires a stretch and the concept is easily initially confused with much that it is not at all about. The concept of Cultural Maturity starts with the recognition that culture’s guiding rules on most all fronts—clear moral codes, tight bonds in community, unswerving nationalistic allegiances—are becoming less and less reliable. Our times are challenging us to step beyond the comforting surety of familiar cultural guideposts to take a new maturity of responsibility in the choices we both in our daily lives and as cultural beings. But the challenge is deeper. Questions of all sorts are requiring a greater complexity and maturity of thought than required in times past. The task is more than just some post-modern surrendering of past sureties. The future requires that we act from a mature fullness of perspective and think and act with a dynamism and systemic subtlety not before ours to entertain. We can get to the concept of Cultural Maturity in three different ways each of which provides its particular perspective. First, we can look at the new, increasingly God-like challenges before us and examine the capacities they will require if we are to address them effectively. The second way applies developmental perspective. Creative Systems Theory describes how we find direct parallels between the challenges we confront in our times and those those presented by the tasks of second-half-of-life maturity in individual development (and ultimately in second-half developmental tasks in formative processes of all sorts). The third approach is cognitive. Creative Systems Theory describes how we can understand all of Cultural Maturity’s changes in terms of a developmentally predicted process of cognitive reorganization. With the resulting “Integrative Meta-perspective,” both more systemic understanding and more mature ways of acting and relating come to seem like common sense. In all parts of our lives, today, we confront new kinds of challenges, issues of great significance that cannot be escaped. We also confront that these challenges can prove impossible to make adequate sense of, much less address, limited to common assumptions. Front-page news concern such as terrorism, climate change, and the need to fundamentally rethink global economic structures provide the most obvious examples of such newly God-like challenges. But we will also face more personal new concerns that are just as inescapable and perplexing—such as how to make good moral choices without the traditional surety of cultural belief to guide us, or how to understand what it means to be a man or a woman without clear gender roles. The new nature of the challenges we face at least affirms the concept of Cultural Maturity’s importance. Today’s challenges require more encompassing ways of understanding and more nuanced perspective than those of times past. Put more theoretically, the critical questions before us are systemic in nature, and systemic in a particular sense. The concept of Cultural Maturity offers a way to understand why this might be the case. It also helps us understand the specific new human capacities—personal, interpersonal, and collective—that today’s new questions will demand of us. A look to some of the questions that will more and more confront us in times ahead and that will cut across various blog posts helps deepen our grasp of what Cultural Maturity is about. A handful of such critical concerns (with a link that briefly examines each of them): How will we keep from destroying ourselves (as weapons of mass destruction become ever more widely available)? What, in the future, will it mean to act morally (given the world’s overwhelming diversity of traditions and beliefs)? How, for time ahead, do we best conceive of progress (if progress is to produce real human advancement)? How will love work in the future (as traditional gender roles and culturally specific rules of relationship less and less serve us)? What will it mean to lead in times ahead (given today’s crises of confidence in leadership of all kinds)? Will we have community in the future (given our increasingly mobile and globally interconnected lives)? How will we come to understand life—and death —in the future (as we likely become able to keep people alive almost indefinitely)? How will we best manage emerging technologies (with their ability increasingly to be both wondrous and potentially our undoing)? What will be the future of government and governance (given our increasingly complex and globalized world)? We can think of Cultural Maturity in terms of a series of related changes, each illustrated by these key challenges. First, Cultural Maturity is about a new kind of human responsibility. It involves stepping beyond a parental relationship with cultural truth. In times past, culture has served as a symbolic parent to the lives of we mortals. Each of these questions, to be at all effectively answered, demands a new kind of human responsibility. It is a responsibility twice over, not just for acting responsibly, but for discerning what right action should entail. The concept of Cultural Maturity argues that a parental perception of culture, while it has served us well through history, for the future presents real problems. It then goes further to describe how a more mature perspective not only alters responsibility, it fundamentally alters how the world looks. A key function of cultural beliefs and structures has been to protect us—like children—from reality’s magnitude, from life’s full complexity and profundity. Cultural Maturity also involves bringing a new kind of complexity, dynamism and nuance in our thinking. Each of these questions demands a new creativity and sophistication in how we understand. Each requires a new subtlety in the distinctions we make—whether the distinctions of moral choice or the nuances of leadership. Each also requires that we better see the whole of things, recognize interconnections, think systemically — whether the connections are environmental, social, political, psychological, or spiritual. Questions of all sorts call not just for greater perspective, but new ways of understanding what it means to have a perspective. Cultural Maturity is also about a fullness and maturity in how we relate really new to us as a species. It is about one country engaging another without the need for “chosen people” and “evil others.” It is about taking ownership in leadership at a level we have not before known. It is about loving more as whole people. Ultimately, it is about a new systemic completeness in how we relate at every level. Culturally Mature relating is Whole Person/Whole System relating. The is also a more overarching sort of change Cultural Maturity is about. The needed new responsibility Cultural Maturity confers is not just for fresh ways of understanding, but for a new guiding story. We need fuller ways of understanding what our times are about and what they ask of us. Most of the stories we are most familiar with—the common onward and upward story of material progress, religious images that set belief against belief, narrow political ideologies—not only less and less serve us, increasingly they put us at risk. And few of those proposed as new solutions in the end prove sufficient either for the practical tasks of good decision-making or for a deep and realistic sense of hope and possibility. The concept of Cultural Maturity provides a narrative for the future that is both compelling in its implications and practical in the guidance it provides. Creative Systems Theory describes how we find related shifts in perspective with maturity in our individual lifetimes and also in the mature stages of human change processes wherever we find them. This recognition of developmental parallels supports the conclusion that the new tasks and possibilities described by the idea of a new species maturity are developmentally predicted. Developmental parallels also let us be more specific about just what the word maturity in Cultural Maturity implies. The developmental analogy refers not to growing up in the sense of becoming adult, but to the more “mature maturity” that results from engaging second-half-of-life developmental tasks. It is essential that our choices in the future be not just intelligent, but wise. This distinction helps clarify how more than just greater knowledge is the expected outcome of Cultural Maturity’s changes. The cognitive reorganization that comes with Cultural Maturity—what Creative Systems Theory calls Integrative Meta-perspective—reveals a more complex and nuanced world. We will more and more need the greater subtlety of understanding that results not just to answer critical questions, but often just for the questions themselves to make sense. In return for the stretch this greater maturity and complexity of perspective demands of us, we get a world newly rich and creative in what it has to teach. Integrative Meta-perspective alters not just what we think, but how we think. Teasing apart just how is a rewarding but also multifaceted topic. Three related observations provide a beginning glimpse and help tie the concept back to Cultural Maturity’s changes. The first has to do with how the needed greater maturity of thought requires more than just rational processes. Decision-making that is not just intelligent, but wise—able to address complex contextual relationships and nuanced questions of value—must draw on more of our cognitive complexity. ( More.) The second concerns the way successful culturally mature thinking is systemic in the sense of bridging conventional conceptual polarities—ally and enemy, leader and follower, mind and body, political left and political right, humankind and nature. Integrative Meta-perspective helps get out minds around such limited world-views and the simplistic ideologies that commonly accompany them. (More) Third, is how it offers that we might think in ways that let us more directly appreciate we are living beings. The great advance in understanding through which the Modern Age replaced medieval belief had its roots in the idea that reality was a great machine. But we are not machines. And the essential question before us cannot ultimately be answered in machine terms. In the end they are questions of life, questions of purpose and living interrelationship. (More). There are ways in which Cultural Maturity is a simple concept. In the sense that we can apply it to all sorts of questions across domains of culture, it is a single brushstroke notion. And, while historical and philosophical perspective helps, in the end it doesn’t require extensive intellectual understanding. It is less about particular beliefs, than the about the ability to get our arms around and tolerate a less certain, but ultimate more creative and complete, kind of reality—to hold experience with a more mature fullness. All of Cultural Maturity’s conclusions follow from what the world look’s like from that more “grown up” place. But, that said, the concept is not easy in what it asks of us. For most people, understanding requires surrendering assumptions (often favorite ones). It means stretching sufficiently that one can tolerate the more nuanced and complex world the culturally mature perspective reveals. And it means being open not just to fresh perspective, but thinking in unfamiliar ways. Again, Cultural Maturity is in the end common sense. The difference is just that this is a sort of common sense that we are only now becoming capable of. Various books by Charles Johnston come at the tricky task of articulating what the future will require—in the end, what Cultural Maturity is about—us from a different angle. The Creative Imperative (1984) approaches the question historically, looking at how culture has evolved to this point and the unique evolutionary tasks our times present. Necessary Wisdom (1991) uses a more applied approach. I takes that observation that thought able to effectively address future questions bridge familiar polar assumptions and examine its pertinence to various realms of understanding. Quick and Dirty Answers to the Biggest of Questions: Creative Systems Theory Answers What It is All About (Really) proposes that many of humanity’s most elusive questions have remained quandaries because they require Culturally Mature perspective if they are to be usefully framed and answered (then goes on to propose answers). 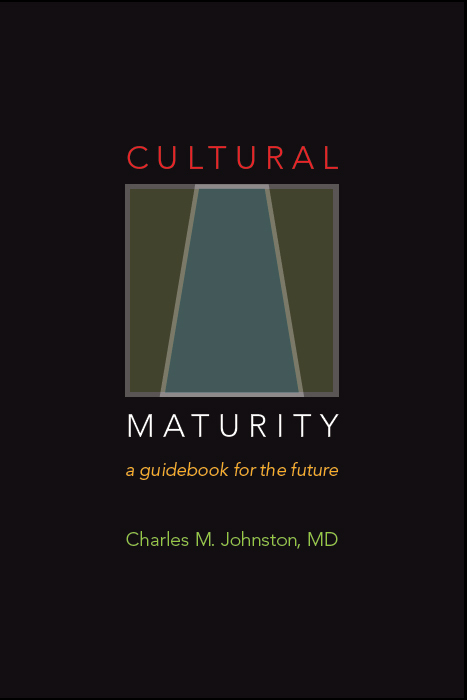 And Cultural Maturity: A Guidebook for the Future is written for change agents and leaders and is structure around a small handful of change themes that run through critical questions of all sorts. 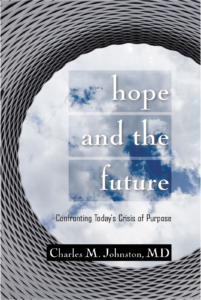 Hope and the Future will be released in a couple of years. It takes a similar approach to Cultural Maturity but goes into much greater depth and detail. The Defining Themes section examines the kinds of change Cultural Maturity produces. On first blush, today’s new questions can seem wholly distinct, and any attempt to address them all in one place ill-conceived. But while the specifics of today’s new challenges could often not be more different, we find fundamental similarities in what these concerns ask of us. Put in the context of Cultural Maturity, we can think of these common themes as key “developmental tasks.” Appreciating these similarities provides guidance for confronting the challenge ahead and also supports the conclusion that change of an encompassing sort is afoot. The Compare and Contrast section turns to how Cultural Maturity differs from other views of the future. Cultural Maturity involves distinctions that may at first seem subtle, but which have make-or-break significance. Here we look at five common interpretive perspectives people use when looking at the future: “We’ve Arrived” scenarios, “We’ve Gone Astray” scenarios, “Post-Modern/Constructivist” scenarios, “Post Industrial/Information Age” scenarios, and Transformational/New Paradigm” scenarios. The concept of Cultural Maturity sees in each a piece of the truth and also fatal shortcomings. The Domains section addresses how the concept of Cultural Maturity applies to particular concerns, both specific topics (such as morality or leadership) and broader domains of culture (such as government or art). The Theory Topics section addresses concepts that may be pertinent to blog posts. Most draw on the thinking of Creative Systems Theory, but some apply more generally to culturally mature perspective.